Below is the first in a series of biographies from Mrs. Yollis' Class. Each student researched a person, wrote an informative report, and created a sculpture of the historic person. Dianne Feinstein is a U.S. Senator for California and works in the Legislative Branch. 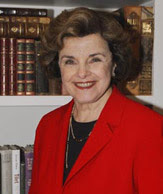 Senator Feinstein was born on June 22, 1933, as Dianne Emiel Goldman. As a young child, she attended an elite Roman Catholic High School even though she was the only Jewish person enrolled there. After graduating from Stanford University in 1955, she gained her first political experience as an intern at the prestigious Coro Foundation. She was elected to the San Francisco County Board of Supervisors in 1969, and shortly thereafter married Berman Feinstein, a prominent brain surgeon. In 1978, she became the first woman elected Mayor of San Francisco. Senator Feinstein entered the U.S. Senate in 1992, where she continues to serve today. She has earned a reputation for helping strengthen our nation’s security and as a protector of our environment. In addition to creating and helping to pass numerous important laws, Senator Feinstein’s greatest accomplishments include chairing the Senate Select Committee and presiding over the inauguration of President Obama. In my opinion, Dianne Feinstein is a very intelligent woman who, in dedicating much of her life to serve the government, has made our country a better place to live. Here is a hyperlink to Senator Feinstein's website. Below is a presentation of my scupture of Senator Feinstein. Please leave a comment for Matthew. How did you like his blog post? Do you have any questions for him? and that flag that you use was a great idea. You've made a very nice presentation! What wonderfull skills you have in research work! I think your biography on Senator Feinstein was interesting. I wonder what it was like for her being the only Jewish kid in an all Catholic high school? I also think it is neat that you got someone from Russia to comment on your biography! Congratulations on yet another Digital Voice Award: Best Overall Elementary! As a parent, I am thrilled that Shane has had the opportunity to be in your class and have such high level and responsible exposure to internet media. We enjoyed the biography you prepared. I thought it was very interesting to read that she was the first elected Mayor of San Francisco. I also think it would be fascinating to ask Senator Feinstein what it was like to be at the inauguration of President Obama. What do you think her response would be? Wow is an understatement! We are so proud of all of you and your tremendous achievements receiving the Digital Voice Awards in 2 areas. We've always heard how special you are as a teacher, but you never cease to amaze us with your "cutting edge" teaching style and your dedication to each student. We are very grateful for having been part of such a special class. I love your biography about Senator Feinstein! That was really smart of you to put a American Flag in the backround! I love that you also talked about what she was wearing. Wow Matthew . . . I am so impressed with your biography of Senator Feinstein. You clearly are an expert on her life and accomplishments. I think you are a great writer. I am wondering why you decided to learn about Senator Feinstein? Why were you interested in learning more about her? Thank you for sharing your research. Thank you so much for your comment. Everyone had to do a biography on someone who was either a great leader or someone who invented something. I chose Senator Feinstein because I wanted to learn about a California senator. Thanks for reading and commenting on my report. I don't think she would be afraid of being the only Jewish person in the school because she talks in front of a lot of people in her job. Thanks for commenting. Emily actually made the American flag. I just got the idea of putting on the pearl necklace from a close picture of her. I love your post about Diane Feinstein. I was wondering if you ever wanted to talk or see to her in person. I like how you used the pearl necklace from the picture and all of your other details, too. You are a very good writer.